Leading Age Services Australia has welcomed the Federal Government’s progress today on its commitment to establish a national network of specialist care units to provide care for people exhibiting very severe behavioural and psychological symptoms of dementia. The Government says the program will see more than 30 specialist care units established across the country. Welcoming the announcement, LASA CEO Sean Rooney said it is also important that all aged care facilities are adequately funded and staff are trained to provide high quality dementia care regardless of whether they have a dementia specific care unit. “The Australian Institute of Health and Welfare (AIHW) estimated in 2016 that up to 90% of residents in high care may have some form of cognitive impairment. 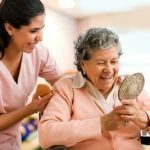 “Given the high proportion of aged care residents needing additional support, it is critical that dementia care is also seen as part of the core business of mainstream aged care facilities and is appropriately supported by government. “Innovative dementia care will draw on principles that maximise independence, reinforce personal identity, enhance self-esteem and confidence, demonstrate care for staff and welcome relatives and the local community.